I became a “Marooner” as a high school senior. I would say that my love of the pop-rock band developed from my growing appreciation of new kinds of music at age eighteen mixed with the understanding of romantic troubles and emotions that do not really develop until one experiences a few ups and downs related to love. Since most of the band’s music revolves around breakups and similar relationship troubles, it makes sense that I began to appreciate their songs around the same age that a lot of young people are beginning to experience more complicated love-related issues. I have been dreaming of attending a Maroon 5 concert since I was a college freshman or sophomore – it is actually physically written down on my “To-Do” list (I don’t consider this a Bucket List, since I have decided it is a little weird to be thinking about the end of life to that extent when I am still pretty darn young). I received tickets for the band’s 2018 Tour during the 2017 holiday season, so you can imagine how excited I was. 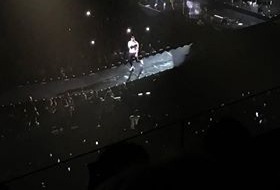 I attended that concert this past Friday, September 14th, at the United Center in Chicago, IL, and I wanted to share some of my reflections on the band and how they have progressed since I became a fan. I also want to cover how I have changed since then and how that has affected my experience. The concert was amazing; I feel that almost any attendee would have felt that way. The lights, the booming bass and the enthusiasm that Adam Levine and band still exhibit after almost 20 years on stage were all breathtaking. 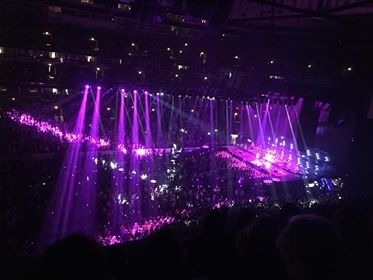 The set list resembled a Maroon 5 walk through memory lane, as hits from almost all of their albums were performed and loved by fans of all ages. The band really highlighted their range and how they have morphed their style throughout the years, and yet they also demonstrated the flawless stage presence and commitment to catchy beats that make them Maroon 5, no matter what year it is or what style they are experimenting with. If it isn’t already obvious, I was blown away by Maroon 5’s performance in Chicago. I did not have the best seats in the house - but I had a very clear, if miniaturized, view of the stage, and was able to tell that each member of the band is still giving it his all after almost two decades of performing. I also found Adam Levine’s speech on appreciating one’s fans to be important and a nice touch. I couldn’t stop singing and jumping out of my seat to dance, which is a testament to the performance in itself. I am not so much in “break-up mode” right now like I was when I was eighteen or twenty, but I was happy to find that I still really loved hearing the live music that Maroon 5 performed, probably as much as I would have a few years back. I especially enjoyed “Lost Stars,” a song from a favorite movie of mine, Begin Again (which in fact features Adam Levine), which the band dedicated to Mac Miller, who passed away on September 7th of this year. I wasn’t expecting to hear this more toned-down piece performed live at the concert and found it to be a welcome surprise. 1. Maroon 5 is as masterful of a pop-rock band as ever, and their live performing style is highly impressive, just as all of the videos I have watched of their performances over the years led me to believe. 2. I am still as impressed by the band as I was when I started college, even though my life circumstances and the band’s style has changed dramatically in that time. I believe that my experience really speaks to Maroon 5’s almost magical staying power in the popular music realm, which seems to have led to them being a group that has successfully stayed relevant since the early 2000’s. Fans young and old from all walks of life cheered, clapped and sang along with Adam & company on September 14th, proving that music, at least music that is skillfully and artistically performed and arranged, really can bring people together.